The Dr. Robert pedal was designed to be a perfect replica of the iconic Vox UL730 amp. Aclam has announced its new Dr. Robert pedal. The Dr. Robert pedal was designed to be a perfect replica of the iconic Vox UL730 amp, famously used by The Beatles on Sgt. Pepper's Lonely Hearts Club Band. The pedal's artwork was designed by Klaus Voormann, who designed the cover of The Beatles' Revolver. The pedal features an extra saturation function, a smart track fastening system and True Bypass switching. It will be available April 2. The price of the pedal has yet to be revealed. 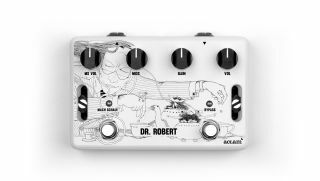 Aclam is also holding a giveaway contest for the pedal on dr.robertpedal.com. The deadline to enter is April 1. For more info on the pedal, head on over to dr.robertpedal.com.